30 Guests Have Been Added For SDCC! You can see the entire list here but here’s a sample of who’s been added. Jim Lee is a renowned comic book artist and the co-publisher of DC Entertainment. Prior to his current post, he served as editorial director, where he oversaw WildStorm Studios and was also the artist for many of DC Comics’ bestselling comic books and graphic novels, including All Star Batman And Robin, The Boy Wonder, Batman: Hush, and Superman: For Tomorrow. He also serves as the executive creative director for the DC Universe Online (DCUO) massively multiplayer action game from Sony Online Entertainment (SOE). As part of DC Comics’ The New 52, Lee is drawing Justice League. Kate Beaton is a Canadian cartoonist who first appeared on the comics scene in 2007 with her online series Hark! A Vagrant!, which has been collected into book form by Drawn and Quarterly. Since then she has become a fan favorite, with illustrations appearing in places like The New Yorker, Harper’s, and Marvel’s Strange Tales anthology. Praised for their expression, intelligence, and comic timing, her cartoons often display a wonderfully light touch on historical and literary topics. The jokes are a knowing look at history through a modern perspective and a campaign against anyone who thinks that history is boring. Are you autistic because you’re a geek? Or are you a geek because you’re autistic? Would you even mention it during an internship interview? I’ve been asked numerous times if my interest in technology is somehow connected to having an “autistic” brain. However, I’m reasonably certain no one had asked if technology made me autistic. Yet, the question was asked last week. Now, I can’t really argue the point too much. I’m a techie or geek or whatever you want to call me. I’ve loved computers since I first sat down at an Atari 800. Asking a diagnosed autistic programmer about a trend among programmers? I’m not sure I can be objective. Seeking to clarify, the programmer asked me if there was now a somewhat nonchalant, or reckless, impulse to think of all “geeks” as autistic. He described self-diagnosed Aspergers as “trendy” among some of the young programmers he has interviewed in the last year or so. It’s as if coding turns you into an “Aspie” somehow. It seems like these kids are linking programming and autism. You can be good programmer and just be a good programmer. I asked if this wasn’t a bit of hyperbole. I was assured it wasn’t, and that the hiring committee at this company has been a bit taken aback by the situation. We’re all a little different, at least in the development side of the building. We sit in our offices and don’t always realize the rest of the building has headed home. Yeah, we’re different. But none of us ever thought we had a disorder. I’m fairly certain that a greater percentage of programmers, engineers, scientists, and mathematicians do have “autistic” traits. I’m not alone in that assumption. So, in the end, I don’t know what this trend means. Maybe more of the programmer’s colleagues have autistic traits than he realizes? Or maybe “Aspie” is a trendy way to describe the traits that have long made programmers different? I can safely state that the computer itself and coding has not made me “more autistic” than anything else in life. If I didn’t focus my energy on computers, I’d focus on something else. 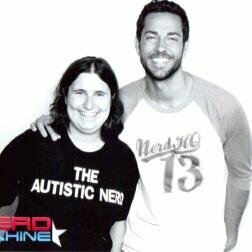 Zach Levi Dishes on Nerd HQ at SDCC ’12! Last night during Spike TV’s CES All Access Live Nerd Machine’s Zach Levi & David Coleman were on hand to discuss some cool sights they saw at CES but what I felt was important for you guys was the early info on what the SDCC plans are for Nerd Machine! I love how they mentioned that last year’s Nerd HQ raised for $40,000 for operation smile, way to go team! Also, here is a link to the newly renovated Culy Warehouse (between 6th & 7th) if you want to see more info or map out your trails early! SDCC Member ID Reg. Open To The Public! Remember, everyone needs one in order to attend San Diego Comic Con! If you are a returning professional or trade professional, please visit http://www.comic-con.org/cci/cci_pros.php for specific details on how to register for a professional Member ID. If you are a returning member of the press, please visit http://www.comic-con.org/cci/cci_press.php for specific details on how to register for a Member ID.